Queer making and design practices have always existed, but it is only recently that Queer Game Studies has emerged as a rapidly expanding field through the efforts of queer scholars. In The Queer Art of Failure, Halberstam suggests, “Under certain circumstances failing, losing, forgetting, unmaking, undoing, unbecoming, not knowing may in fact offer more creative, more cooperative, more surprising ways of being in the world.” In reimagining what it means to fail and what it means to succeed, queer games can offer rich experiences that move beyond the goals and practices of the hegemonic status quo of mainstream games. Queer design perspectives, particularly when they fail to meet the expectations of the status quo, can bring “difference” to “our discussions of video games and the experience of play” (after Ruberg 2015), and we want to hear all about it. Expanding on the work of queer games scholars such as Bo Ruberg and Adrienne Shaw (see: Queer Game Studies 2017), artists and designers such as Mattie Brice and Robert Yang, and events like GaymerX and QGCon (the Queerness and Games Conference), this special issue will take an intersectional approach in seeking work that explores queer making and design perspectives. 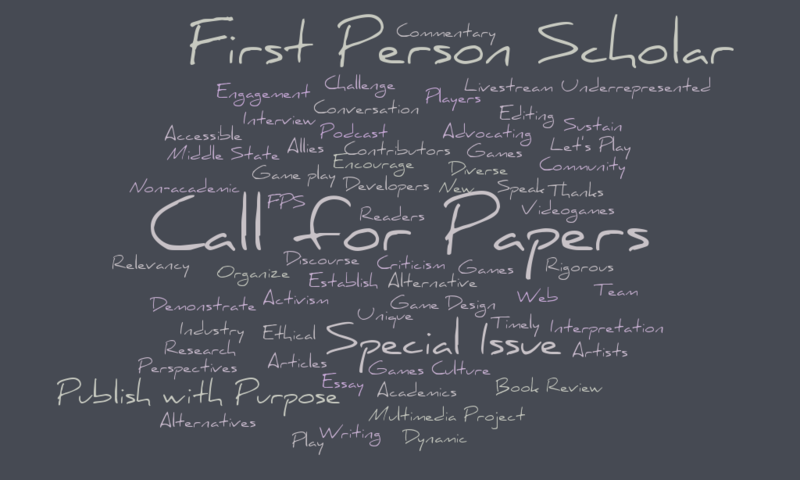 We want to hear from designers, makers, artists and others who make or study queer games. Abstracts should be 150-250 words in length, and are due by Dec. 7, 2018. Articles may be commentaries, essays, book reviews, interviews, multi-media projects, or other formats. Send to guest editor Jess Marcotte at jess.ro.marcotte@gmail.com.